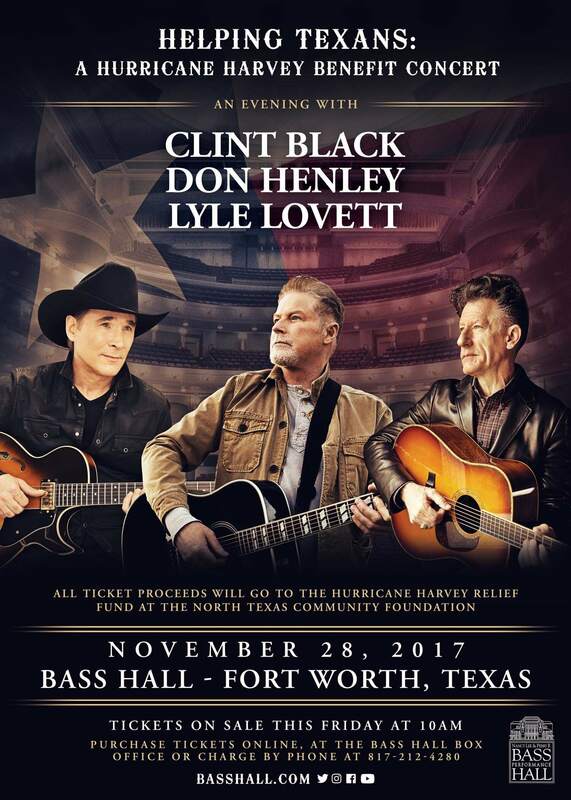 When Don Henley, Clint Black and Lyle Lovett take the stage at Bass Hall in Fort Worth, Texas on Tuesday, November 28th, they’ll be doing so in support of their fellow Texans, whose lives have been upended by the ravages of one of the most vicious hurricanes in history. HELPING TEXANS: A HURRICANE HARVEY BENEFIT CONCERT will be a one-of-a-kind event where all ticket proceeds will go to The Hurricane Harvey Relief Fund at the North Texas Community Foundation, which will distribute the funds to charitable organizations and programs working in Houston and Aransas County to bring relief to those affected by Harvey. These distributions will be allocated according to the advice of Clint Black, Don Henley, Lyle Lovett and Ed Bass. The artists are donating their time and all expenses for the event are being underwritten by Ed Bass so that full proceeds from tickets sales and sponsorships will go to Hurricane Harvey Relief. Tickets for HELPING TEXANS: A HURRICANE HARVEY BENEFIT CONCERT will be available to the public at www.basshall.com and by phone at 817-212-4280 this Friday, September 22nd. “We all watched on the news as Harvey destroyed much of Southeast Texas and Houston, my hometown,” said country icon Clint Black. “We braced ourselves through the night as the flood waters grew closer to our family's doorsteps in Houston and Katy. My mom, brothers, niece and nephews were all very fortunate and I knew I had to find a way to help those who weren’t so lucky, to recover and rebuild what was lost in the hurricane. I’m really proud to have friends like, Don, Lyle and everyone at Bass Performance Hall who'll join together for the cause." “This is another example of Texans helping Texans, and I’m proud to be a part of it,” said legendary artist Don Henley. “I'm honored to join fellow Texans Don Henley, Clint Black, and Ed Bass to raise money for victims of Hurricane Harvey,” said Lyle Lovett. Hurricane Harvey was a Category 4 storm that hit Texas on August 25, 2017. It caused an estimated $180 billion in damage, more than any other natural disaster in U.S history with the exception of Hurricane Katrina. The storm damaged 203,000 homes, of which 12,700 were destroyed. Funds raised through this benefit concert will be deployed for immediate relief and will also address the communities’ long-term needs, which are likely to include rebuilding homes, schools, and community facilities and supporting survivors’ physical and mental health needs.